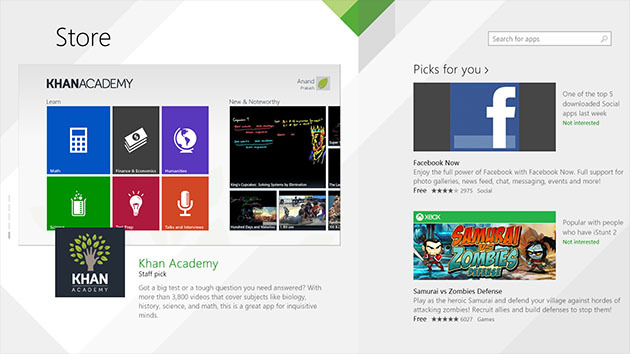 Khan Academy app launched with Windows 8 last October. A few of us worked together to get the first version developed just in time for Windows 8 launch. Since then, there have been a few minor updates and a big overhaul which was published in store last month. This week is another great milestone: the app is now open source and ready for anyone to contribute. I developed the initial version with a lot of help from folks over at Khan Academy and an internal Microsoft team. It was really a port of Learning Circle phone app to Windows 8 so naturally, this was developed using C# and XAML. ← Can technology help fight corruption? Hey, Are you planning on open sourcing the windows phone app? I’d like to be able to add my own learning sources to the app. There are tons of podcasts out there that have great learning material, and the framework provided by learning circle makes adding custom sources (like a podcast) seem like a natural next step. What do you think? @shiv, there is no plan for making the phone app open source at this point and I can’t say for sure if this would change. If you are looking for a podcast client, there are a bunch of those in phone store. What sources are you thinking of including in learning circle?